While the price tag of Huawei Honor 3C is expected to be quite low despite featuring a quad-core processor, you might be able to obtain the new smartphone for free as what we have mentioned in our previous post. How? Well, all you need to do is just guess its price. 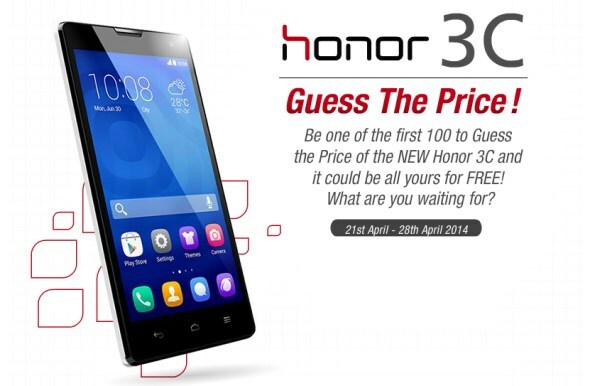 You read that right: just guess the price for the device through this contest at Huawei Malaysia’s Facebook page. Furthermore, there will not only be just one winner or two winners…in fact, Huawei Malaysia will be giving the device to the first 100 participants that manage to guess the price correctly. According to our sources within the industry, Huawei Honor 3C might be priced at under RM 600 when it is released in Malaysia on 29 April. That being said, do note that nothing is official until it is officially announced by the folks at Huawei Malaysia themselves. Else, what’s the point of having this contest? So, what say you? Head on to Huawei Malaysia’s Facebook page right away to submit your predictions and let’s see if you are one of the first 100 people that able to guess the price correctly.